William Ledeuil, French Michelin-starred chef came to the institute to perform a demonstration of some of his recipes. He also presented citrus fruits and their use in cooking. Chef Ledeuil is chef and owner of 3 restaurants in Paris: Ze Kitchen Gallery, KGB (Kitchen Gallery Bis) and Kitchen Ter (re). Le Cordon Bleu has kicked off the New Year by renewing its resolution to achieve precision and excellence. Our first guest chef of the season, chef and restaurant owner, William Ledeuil. 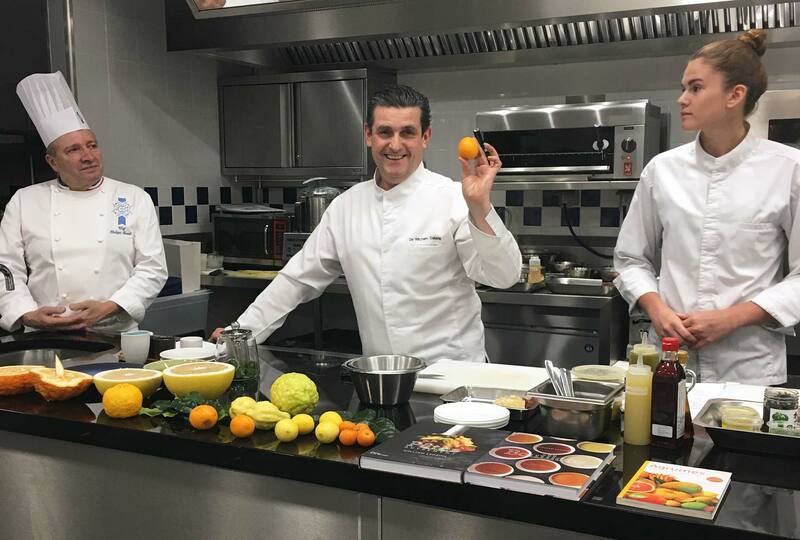 Chef Ledeuil made, on January 18, a presentation - demonstration around citrus fruits. Born in the Berri region of France, to a family of butchers, chef Ledeuil decided to learn the ropes by carrying out an apprenticeship after completing a BTS in Business Management. He undertook his end of studies internship with Guy Savoy for whom he ended up working for 12 years, managing three of his restaurants: the Bistrot de l’étoile, les Bouquinistes and the Cap Vernet in Paris. He went on to open his own businesses: his first restaurant, whose decor rivals that of an art gallery, Ze Kitchen Galerie opened in 2002, with healthy ingredients mainly cooked in a wok and a la plancha. He then opened his second restaurant, KGB (Kitchen Galerie Bis), whose menu features new-style French hors d’œuvres with an Asian touch, influenced by his trips to Vietnam and Thailand. In his constant pursuit of authenticity and freshness, chef Ledeuil embarked on a third adventure with the concept Kitchen Ter(re) which offers an array of flavoursome broths and pasta, made using heirloom wheat varieties. His inventive and refined style led to chef Ledeuil being awarded his first star by the Michelin Guide in 2008. In 2010, he was voted chef of the year and awarded the Fooding d’honneur prize by Gault et Millau. Who are the other guest chefs and class patrons?